Summer fun is about to begin, days spent at the pool or park, just being outside enjoying the beautiful sun. There's nothing like being all ready for a day of fun when you have an "Oh no!" hair moment. You took your shower and got all ready but notice you missed an entire strip on your leg. Oops! You can fix it in minutes without jumping back into the shower with Gillette! Gillette brings Canadian women a new way to keep those legs smooth in a jiffy with the new Gillette Venus Snap with Embrace. It's the smallest and most compact razor available in Canada! It comes ready to go in a convenient travel case and has an easy-grip mini handle that fits any Venus razor blades! You can choose from your favourites like new Gillette Venus Spa Breeze cartridges. Great to throw in your travel bag, gym bag or purse. No need for shave gel, just a splash of water lathers the cartridge to give you a close, smooth shave on the go. A common "Oh no!" hair moment for me is frizzy, frazzled "summer humidity" hair, as I call it. It's when you can do absolutely nothing with your hair without it turning frizzy and frazzled looking by the time you are finished doing your hair! Ladies, there is a solution to keeping our tresses under control with Vidal Sassoon Pro Series Wave Enhancer Spray and Vidal Sassoon Pro Series Waves Cream Pomade. The 7-in-1 wave enhancing spray allows for maximum styling so you can achieve that beach hair look with ease. After a quick spray, apply the cream pomade for genius curl and wave control. It leaves your hair soft, touchable and beautifully defined for up to 24 hours! Have you ever had an "Oh No!" hair moment? We'd love to hear a time when you could have used these time saving products! Share your story with @Gillette using hashtag #InASnap for shaving mishaps and @VidalSassoon using hashtag #GoodByeFlyAways with your frizzy fumbles! Our friends at P&G want to rid you of "Oh No!" 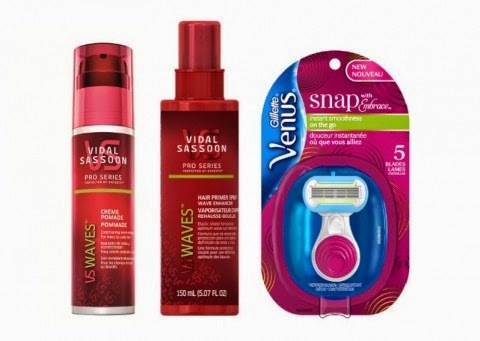 hair moments this summer by offering up a Summer Hair Care Survival Kit ($45 value*) to one lucky AME reader! Open to Canadian residents 18+ excluding Quebec. Mandatory entry must be completed for extras to count. One entry per email/per household. Please use a valid email address upon entering for prize contact purposes. Ends August 1st at 9pm EST! Please note this giveaway may appear on various P&GMom blogs. You may enter on as many of our blogs as you wish however you may only win this prize once. Posted in participation with the P&GMom program. Perks and incentives are received as part of this program however thoughts, opinions and comments on this blog are always honest and my own. Prize provided by representatives of P&G. My oh no moment was when I took my daughter swimming and had forgotten to shave . My oh no moment was when I had a doctor's appointment and didn't bother shaving my legs as I thought there was no reason the Dr. would be checking my legs. Boy was I embarrassed when I had to roll up my pants for the Dr. to reveal my hairy legs. That's taught me to always shave my legs before a Dr's appointment regardless of the reason for my visit! A few years ago I started to feel really sick and could barely shower let alone shave my legs. After a few weeks of misery, I went to the ER and was admitted to hospital for three weeks. I was so embarrassed every time any of the doctors or nurses examined my legs because they were soooo hairy! I took my daughter to the pool and when I was taking my clothes off in the change room I realized I had shaved only one leg that morning. And the other leg hadn't been shaved in quite some time. Ahhhh, you didn't say what hair. Now that I've got everyone's attention lol, it would have to be high school. I bleached my upper lip and being a newbie, left it on too long. Had such a red mark, but still went to school like a trooper! I injured my knee playing ultimate a few years ago and I can't say how many teammates and doctors felt my hairy legs! I make shaving my legs game days a priority now. Forgetting to shave my legs the morning of my wedding... I had to attempt to quickly do them right before and ended up with razor burn! My OH NO hair moment was when it was super hot and I took off my sweater to cool off since I had a tank top underneath and then realize I didn't shave! I frequently wake up with an "Oh No" hair moment when I realize that I fell asleep without fully-dried hair and I have crazy frizz! Last summer I went to a 60s themed night at a bar and gave myself a fantastic beehive.. then you know. Passed out, upon getting home. I woke up in the morning with a hideous tangled mess of frizzy, teased, over sprayed straw. It took a good half hour and a LOT of spray in conditioner to fix that one. Just yesterday we had to go to a doctor appointment and I forgot to spritz my hair with hairspray. Well, after the doctor appointment, I saw myself in a mirror and just about died when I saw how many pieces of hair were curling out of the side of my head! My curly hair just doesn't like to stay tame! Frizzy frizzy hair at a birthday party with so very many pictures, a lot of which were Facebooked. Sigh. I too have been out and realized I could have done a better job shaving...It happens...lol I'm careful though after being in hospital so long without being able to do so. Friends surprised me with a birthday spa day massage unfortunately I hadn't shaved in a few days. My 'Oh No!' hair moment was when I missed a spot shaving and went out in shorts. My Oh No hair moment was when I went to the pool with my son and forgot to bring my brush and my hair dried into this really weird shape. When I got home and looked in the mirror, I was mortified that I was walking around looking like that for over 3 hours. Yikes. Went camping and forgot to shave or bring a razor. Yikes! Humidity causes so much frizz on my head! Forgetting shampoo on a camping trip. Soap just isn't the same on hair.